What does it stand for? What does it mean? MS4 stands for “Municipal Separate Storm Sewer Systems.” On August 6, 2003, unincorporated Porter County was designated as an MS4 entity under Indiana Administrative Code (IAC) 327, Article 15-13, commonly referred to as “Rule 13.” This designation was determined by the Indiana Department of Environmental Management (IDEM) as mandated by the Environmental Protection Agency (EPA) as a part of the Clean Water Act of 1972. MS4s are defined as a conveyance or system of conveyances owned by a state, county, city, town, or other public entity that discharges to waters of the State of Indiana or United States and is designed or used for collecting or conveying storm water. Regulated conveyance systems include any roads with drainage systems, county roads, gutters, curbs, catch basins, inlets, piped storm drains, pumping facilities, retention and detention basins, natural and human-made or altered drainage ditches/channels, reservoirs, and other drainage structures. MS4 conveyances within urbanized areas have one of the greatest potentials for polluted storm water runoff. Urbanization alters the natural infiltration capacity of the land and generates pollutants causing an increase in storm water runoff volumes and pollutant loadings. Construction sites which disturb more than one acre of land are required to seek storm water permits through IDEM as part of the construction process per IAC 327 Article 15-5 commonly referred to as “Rule 5.” Land disturbances include grading, digging, cutting, scraping, or excavating of soil, placement of fill materials, paving, construction, or substantial removal of vegetation, any activity which bares soil or rock or involves the diversion or piping of any natural or man-made watercourse. 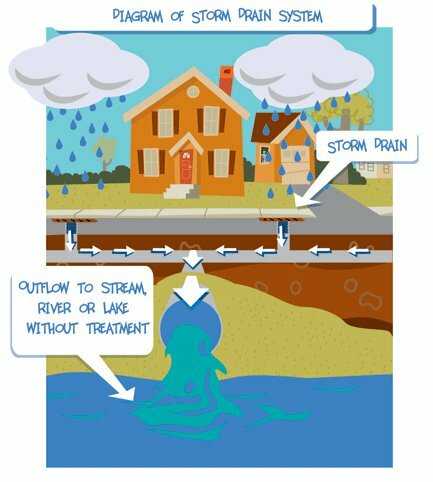 Storm water permits specifically target the quality of the storm water run-off and are approved and issued by IDEM and are administered locally by the Porter County (PC) MS4. The PC MS4 is responsible for the quality of storm water run-off in unincorporated Porter County which is discharged from an active construction site (private, industrial or municipal) and does this by conducting periodic inspections of construction sites to make sure that the quality of the water run-off conforms to EPA established standards. MCM#1 - Public Education and Outreach, includes County Employee Annual Training, Contractor Workshops, Public Survey, Web Page Development, Printed Materials and Educational Display. MCM#2 - Public Participation and Involvement, includes Community Cleanup, Public Presentation, Children Education and Household Hazardous Waste Programs. MCM#3 - Illicit Discharge Detection and Elimination (IDDE), includes Storm Sewer Mapping Program, Legal Enforcement and Field Assessments. MCM#4 - Construction Site Runoff Control, includes Storm Quality and Quantity Ordinance, Site Plan As-Built Review, Site Inspection Procedures and Public Reporting Procedures. MCM#5 - Post-Construction Site Runoff Control, includes Hold Meetings with Boards, Develop New Standards and Enforce New Standards. 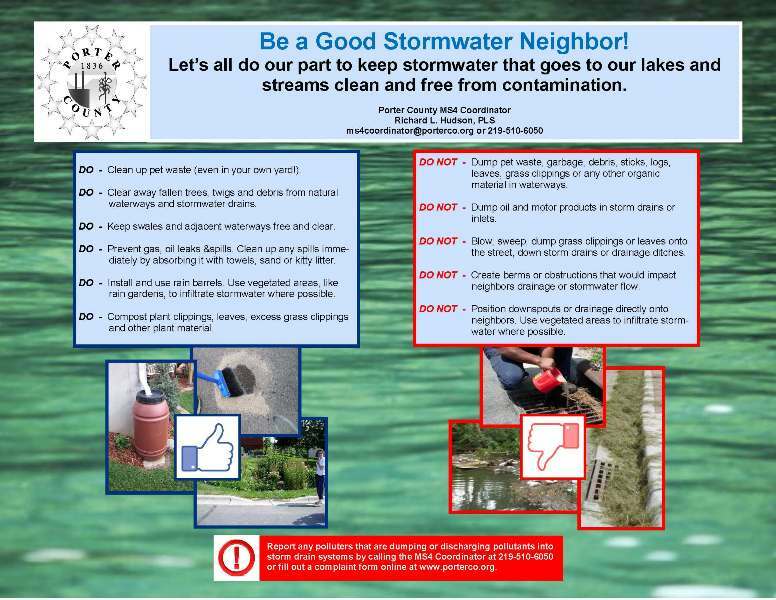 MCM#6 - Pollution Prevention and Good Housekeeping, includes Street Sweeping & Cleaning, Storm Drain System Cleaning, County Owned Facility Maintenance and Inspection, Structural Best Management Practices (BMP) Compliance. 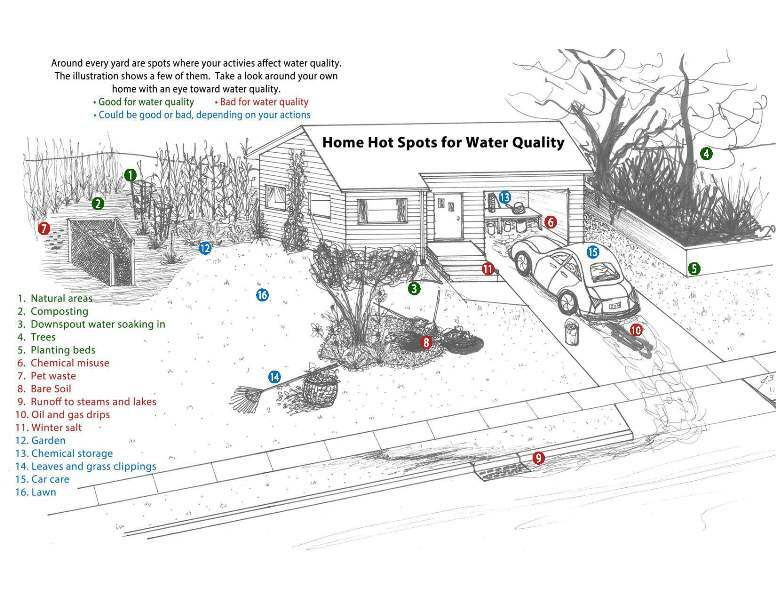 Simply put, the MS4 (Municipal Separate Storm Sewer System) Program addresses the quality of stormwater run-off. The goal of the MS4 Program is to provide a positive water quality impact in our streams, rivers, and lakes. The MS4 Program is an unfunded mandate of the United States Environmental Protection Agency and the Indiana Department of Environmental Management as part of the Phase II National Pollutant Discharge Elimination System (NPDES).